Our Supporter Spotlight highlights individuals or institutions that contribute their time or gifts to the Santas. 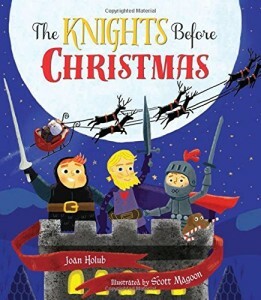 This week, we’re chatting with Scott Magoon, a Massachusetts-based illustrator of several popular children’s books, including his latest, The Knights Before Christmas (Henry Holt and Co., 2015), a spoof of the popular holiday poem. 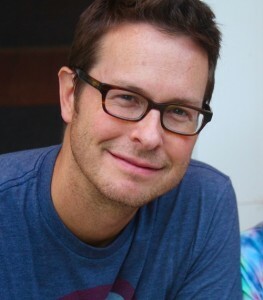 Scott has donated signed copies of his book to our annual Christmas fundraiser and silent auction, and we’re grateful for his talents and support. Santas: We’re familiar with The Night Before Christmas, but The Knights Before Christmas sounds downright medieval. Tell us a little about the concept and the story. Scott: Yes, I went medieval! When I first read author Joan Holub’s manuscript I was captivated by how creative and funny it was—a truly fresh and punny take on Clement Moore’s beloved poem. In our version though, it’s the story of three knights—Polite Knight, Brave Knight and Silent Night—who defend their castle one Christmas eve against a would-be invader clad in a red suit. Of course the stranger turns out to be Santa innocently trying to deliver his presents to the hapless—but well-meaning—knights guarding the castle. A Christmas clash of catapulted candy canes, gingerbread men, sugar plums toys and ultimately the story ends in peace and goodwill and a happy Christmas for all good knights. Santas: As you mention, there are puns and jokes throughout the book, many of which are embedded in your illustrations. Were any of those from your pen or did the author write those? Scott: I love puns and try to work them in to my writing and drawing but Joan had baked most of them right into her manuscript—so all I had to do was draw them. Still, I managed to come up with at least one or two in the art. Santas: You say on your website that Christmas is your favorite holiday. But this is your first Christmas book. What took so long? Scott: Christmas is my favorite holiday. I love the season of goodwill, the family time, the anticipation of the big day, the gifts and of course the tree! But really this is the first Christmas tale to come down the chimney for me as it were and it really was like a little gift to be able to work on it. Santas: We also found the link on your site to your Yule Rule playlist of holiday tunes on Spotify, which is awesome. Putting you on the spot here: countdown your top three for us. 3. Last Christmas / Wham! — I am a child of the 80s and like so many of us I go nostalgia for my “home decade.” Plus this is a catchy tune sung by George Michael and who can’t go for that? 2. Christmas Time is Here — Diana Krall — Really love this song. Sure, its a little bittersweet but the message of keeping the Christmas spirit alive through the year is one that seems to get more vital to me as time passes. I’ve got the Diana Krall version on my playlist, but there are scads of this song performed by others that are just as wonderful. 1. The Christmas Song — Mel Tormé. Mel co-wrote this tune with Bob Wells one hot summer day to cool off—to “stay cool by thinking cool.” Since then there have been recorded countless versions of this song including the arguably definitive version by the great Nat Cole. For my money though its Mel Torme’s velvet fog version. Santas: Hard to argue with any of those choices. Of course, we’re partial to Christmas music and our annual fundraiser, to which you’re contributing, is a a really fun holiday concert with a great band, the Sweetback Sisters. Speaking of your donation, you’re helping some needy families get Christmas trees. I’m curious what role a tree plays in your own annual holiday celebration? Scott: I admire the Christmas Tree Santas’ dedication to needy families at Christmas time for its simple keeping of the spirit and symbolism of the holiday. I’m honored to be a small part of your effort. Like for so many, Christmas trees have played an important part of my family’s Christmases and have made for fond memories. Some years we would go to our back woods to find and cut a tree together. Other times we’d go to a traditional string-of-lightbulb-lit lots to pick it out. But regardless of where we found that perfect tree, we know a real tree is the most genuine and vital, a living thing like Christmas itself. All season long we enjoy its company and on Christmas morning the tree is there, looking quite beautiful as it stands over us as we open our presents. Then, weeks later, at the end of the season I bring the dried tree outside and offer it a silent thanks for the good cheer its brought us. Its not quite goodbye then, though. Despite my best efforts to vacuum the needles I continue to find them scattered here and there in the house throughout the year—like little bookmarks that mark the most wonderful time of the year. Santas: Thanks Scott, and happy holidays!